In October 2013, a group of stakeholders came together to discuss health and well-being in the Oceanside region. They decided to form a group that would invite the community to identify and address health-related issues together. This group evolved to become the Oceanside Health and Wellness Network (OHWN). OHWN is committed to working together to enhance the health and well-being of Oceanside residents with a focus on the determinants of health. We work collaboratively and take collective action on strategic priorities. To respectfully work together to advance the health and wellbeing of the population of Oceanside. By addressing factors that influence health and other complex issues that would benefit from collaboration, we can speak as one voice on these issues. The Oceanside Region includes the municipalities of Parksville and Qualicum Beach and four electoral areas of the Regional District of Nanaimo. The geographic area encompasses two urban centres and several small waterfront and rural communities stretching from Nanoose Bay, Errington/Coombs to Deep Bay/Bowser. 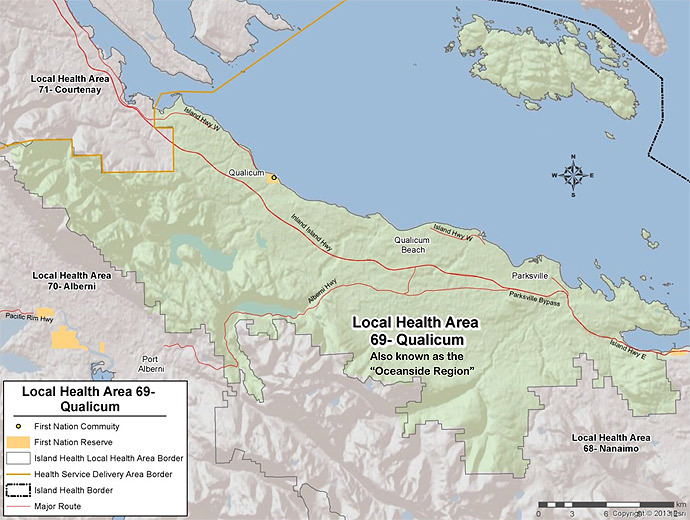 The Oceanside Region is aligned with the boundaries of School District 69 and Local Health Area 69 (Qualicum). The total population of this region is 45,291 (2011 Census). The Regional District of Nanaimo is administering funding from Island Health for the Oceanside Health and Wellness Network. This includes $15,000 of seed funding and support for a part-time coordinator. These factors are complex. Community health networks have a unique role to take action on the determinants of health to improve the overall health of the community.